.......I am! Readyfor Christmas a whole day early, I normally still have things to buy and do on Christmas Eve but not this year, I AM DONE!!! How about you ? I bet you've all been ready for weeks. I have been quiet for too long and I missed it, I missed blogging and blog hoping, but I knew if I decided to peek I would have done nothing. I have made an incredible 412 cards this month. 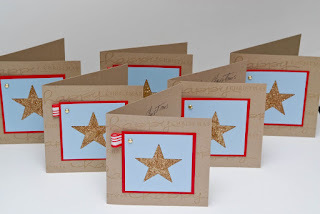 I know it is just unbelievable but I had a lot of customers this past year you see plus my lovely and quite big team plus all the neighbours and relatives and I still managed to leave out a few good friends for which I am ashamed, please forgive me if you haven't received a card from me. 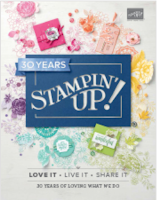 This is my second Christmas as a Stampin'Up! demonstrator and last year I decided to start a tradition and send them a little Christmas ornament. A little something that they could keep and pull out every year. I am kinda thinking in years to come they might even end up with enough ornaments to decorate a small tree. Last year I have sent a white glittered snowflake, I thought I blogged about it (I am sure I took pictures) but cannot find it in my archives so maybe I didn't. 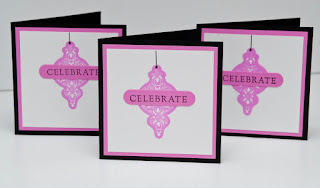 Basic Black, Pixie Pink and Whisper White and the gorgeous Tree Trimming stamp set. Very simple but I loved the touch that made them special, the sentiment laid across the stamped ornament. It came to me as I was playing with different ways of adding it to the cards. Sentiment from the Basic Phrases set. Then I had to think about all my customers those that have supported me over this last year. I had a few more to make than those for my team here they are. Those are slightly bigger 4"x4" and the colours are Kraft, Real Red and Bashful Blue. I have used a cool technique for our monthly team meeting in December using tape and glitter so I have recreated this for my customers cards. 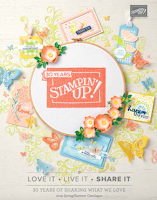 I have used the Happy Everything stamp set and the star punch to punch my aperture. Now I want to add that although I have designed and cut everything for those cards myself I was lucky enough to have a few good friends come and help assemble them one Sunday morning. I want to say a huge thank you to Jane, Joanne, Ali and Linda for helping me, girls you are true stars I just wished you could have stayed a bit longer to help me with the other 200 LOL. I received my lovely star and card this week. Thank you so much! I hope you and your family have a Wonderful Christmas and New Year! Will definitely see you at convention in 2010! have a wonderful time and i'll see you on the 16th!! Thank-you for my lovely christmas star and card Granny Mon! Wishing you a Merry Christmas to you and yours, I hope next year is a good one for you too my lovlie and with a bit of luck we can all sit back, relax and enjoy all our hard work now??! 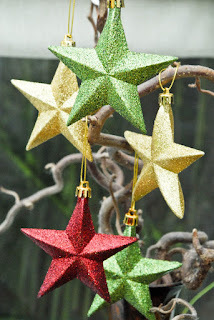 My beautiful card and star ornament arrived yesterday - thank you, they are gorgeous!